Signs of Tc enhancement were recently reported by Superconductors.ORG when the weight ratios of alternating CuO2 planes were increased to create new Sn-based superconducting compounds. 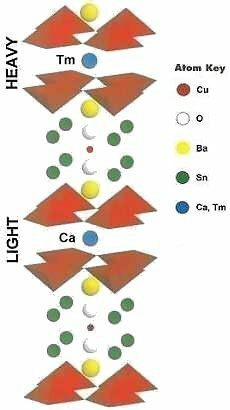 The Tc of Sn-3212-(Sr,Y), for example, improved by roughly 30 degrees with the substitution of calcium and thulium (see graphic above right). Now, a similar 30-degree Tc improvement is reported for Pb2Sr2(Ca,Y)Cu3O8 after weight adjustments were made to its Pb-Cu-O insulating layers. showing Meissner transition near 104K. 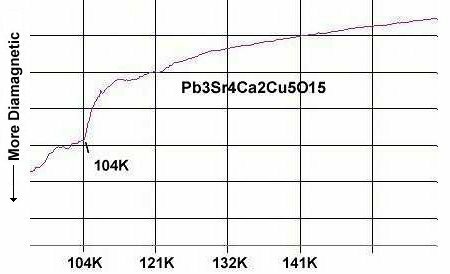 The prototype Pb2Sr2(Ca,Y)Cu3O8 has a critical transition temperature of 70K (1). This new material produced a Meissner transition near 104K (see above graphic), and a drop to zero resistance at 101K, more than a 30-degree improvement over the prototype. The only limitation to planar weight-tilting appears to be that it must be limited to either the copper-oxide planes OR the insulating layers. Attempting both in the same molecule was found to depress Tc. Since Tc improvements are observed through weight adjustments in both the CuO2 planes and in the insulating layers, the phenomenon may not be indigenous to any particular site in the molecule. Rather, phonon mediation may be enhanced. Tilting of planar weights may promote a rippling effect within the unit cell, much like a sports crowd doing "the wave". 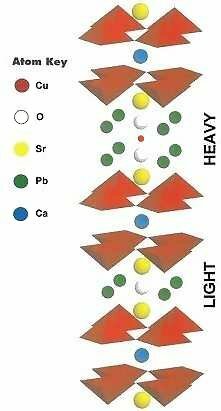 This latest discovery further buttresses this notion, opening the door to a wealth of new superconductor possibilities. Synthesis of the material was by the solid state reaction method. Stoichiometric amounts of the below precursors were mixed, pelletized and sintered for 36 hours at 865C. The pellet was then annealed for 10 hours at 500C in flowing O2.